Attenborosaurus is an unusual plesiosaur because it combines a long neck with a relatively large head. It is classified as a pliosaur in some classifications, but some phylogenies place it in a more basal position. 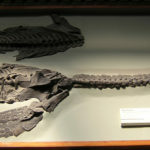 The genus was introduced for ‘Plesiosaurus’ conybeari, a species originally described by Sollas (1881). Bob Bakker coined the new genus name to honour the esteemed wildlife documentarian David Attenborough. 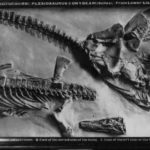 The original holotype specimen of Attenborosaurus, a nearly complete skeleton, was sadly destroyed along with some other plesiosaurs (e.g. Atychodracon megacephalus) during the Blitz of the Second World War. At least three casts of the specimen were made and survive today. One is on display in the Natural History Museum, London. There is also a damaged cast (specimen TCD.47763) in Trinity College, Dublin (Wyse Jackson, 2004), and a cast in the Department of Earth Science, Oxford University. In the Oxford specimen the left side of the skull is exposed. 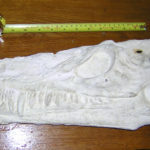 This contrasts with the original specimen and other casts, in which the right side of the skull is exposed. The skull in the Oxford specimen has therefore been mounted upside down. The cast of Attenborosaurus in the Natural History Musuem, London. 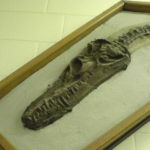 Cast of the Skull of Attenborosaurus, in Trinity College, Dublin. 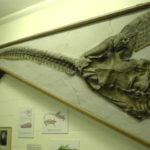 Photograph of a cast of Attenborosaurus in the Department of Earth Science, Oxford University. Photographs by Cait, used with kind permission. 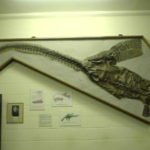 Photographs of a cast of Attenborosaurus in the Department of Earth Science, Oxford University. Photographs by Cait, used with kind permission.